pre-heat the broiler to high. bring a pot of salted water to boil. add the pasta and cook as the label directs. drain and rinse under cold water to stop the cooking. (i even throw in a few extra ice cubes.) shake off the excess water. heat a dry skillet over medium heat. add the almonds and toast, shaking the ban, 4 to 5 min. let cool, then coarsely chop. squeeze the garlic from its skin onto a cutting board. if it doesn’t squeeze easily, rest a large knife broadsided on top of the clove, hit lightly with your fist. you should be able to peel the skin off the garlic. add 1/2 tsp salt, mince and mash the garlic into a paste with a large knife. peel the roasted red peppers and slice into strips; transfer to a large bowl. add the garlic paste and drizzle with the evoo. finely grate about 1 tsp lemon zest into the bowl and squeeze in all of the lemon juice. (roll the lemon on a hard surface before zesting to juice easier and squeeze lemon into your hand to catch any seeds.) thanks for my awesome new zester, babe! if you’re not planning on traveling with the salad, stop at this point and then follow the rest of the steps just before you’re ready to eat. the salad becomes very dry if you don’t eat it right away. 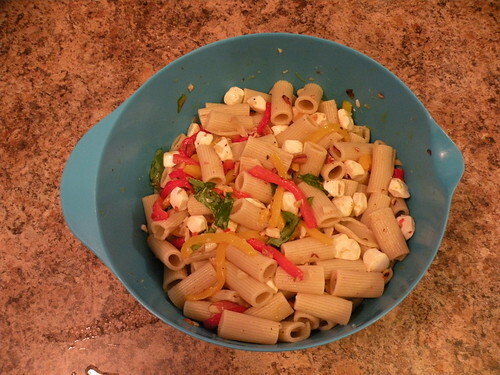 add the bocconcini, basil, almonds, pasta, 1 tsp salt and pepper to taste; toss.